Just as a new year brings the opportunity to make personal improvements; the beginning of 2017 can also be an excellent time to improve your flat commercial roof. When you make improvements to your flat roof, you’ll be rewarded with many benefits, such as better roof drainage, enhanced insulation levels, a more comfortable working environment and other perks. If you own a building with a flat commercial roof, here are four of the best low-cost improvements you can make. Unlike buildings with sloped roofs, structures with flat roofs typically don’t include a crawl space or attic. As a result, roof insulation has to be installed either on the inside of your building or underneath the covering of your roof. Fortunately, there are several low-cost ways to improve your roof’s insulation levels. Although blown-in insulation is the type of insulation that is the simplest to install, it must be done by a qualified professional. The least expensive type is rigid Styrofoam or blanket insulation, which can also be challenging to install without using a professional installer. Another option is loose-fill insulation, which comes in three forms: rock wool, fiberglass or cellulose. While rock wool is available in multi-colors of gray, blue and pink, fiberglass insulation can be yellow, pink or white and is shaped as cotton balls. It entails using a machine for blowing in the insulation. Cellulose insulation looks like gray lint and is made from recycled newspapers. 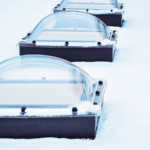 Although cooling a building isn’t an issue now that it’s winter, don’t wait until summer to take care of heat problems. One major disadvantage of a flat roof is that it tends to trap heat. But by installing windcatchers in your roofing, cool air can be directed downward. Windcatchers, which have been used in dry, hot climates for many years, contain a dome in which almost all the vanes are able to turn, even from light breezes. These vanes can direct cool air down into a shaft in a building in hot weather. However, in cooler weather, the vent, located at the base of the windcatcher, can be closed and sealed to prevent cold air from entering. Often, flat roofs look plain. That’s why some business owners use a different color for their roof than what’s used on the rest of the building. By painting your flat roof a different color, you can make it stand out from other buildings, giving it more cosmetic appeal. Furthermore, why not add some trim to your roof so that it draws even more attention. Another idea is extending your flat roof over the edge of your building. This creates shade or even a covered living space, adding dimension and depth to your building, while giving you more room. Regardless of the type of flat roof you have on your commercial building, it’s at risk for a common condition known as ponding water. 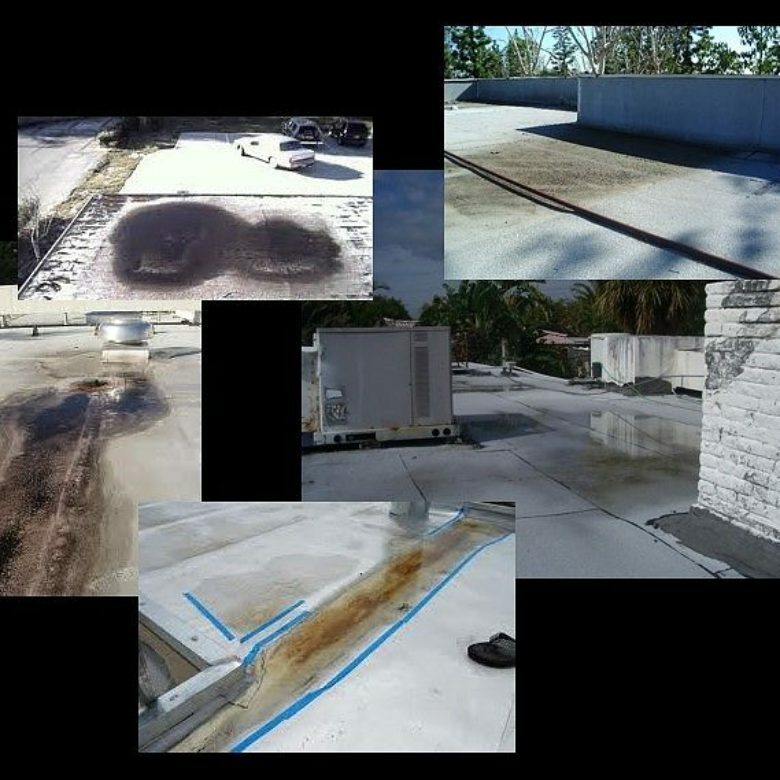 This occurs when water remains on a flat roof for 48 hours or longer after rainfall. To improve drainage, be sure that the gutters and downspouts (“leaders”) are adequate. In other words, they must be large enough for accommodating the area of your flat roof. A skilled roofing specialist should be able to determine this. Often, drainage issues are due to inadequate internal drains. Therefore, check the internal drains to see if they can direct water to the edges of the roof so that water can travel through the scuppers and then down through the gutters and downspouts. 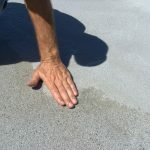 Again, ask a professional roofer if you’re unsure about how to check your roof’s internal drains. Many business owners have solved their drainage problems by adding auxiliary sloping such as RoofSlope, which is a product designed for flat roofs. This is an affordable way to correct improper drainage without having to affect Cap-Sheet installation. You can even detect if a roof suffers from ponding water when there hasn’t been any significant rainfall. This can be done by examining the roof surface and noting dirty circles or vegetation spots, such as algae, which can suggest water ponds. Ignoring ponding water can lead to severe problems, such as leaks, structural damage, reduced lifespan of a roof and vegetation growing on your roof. 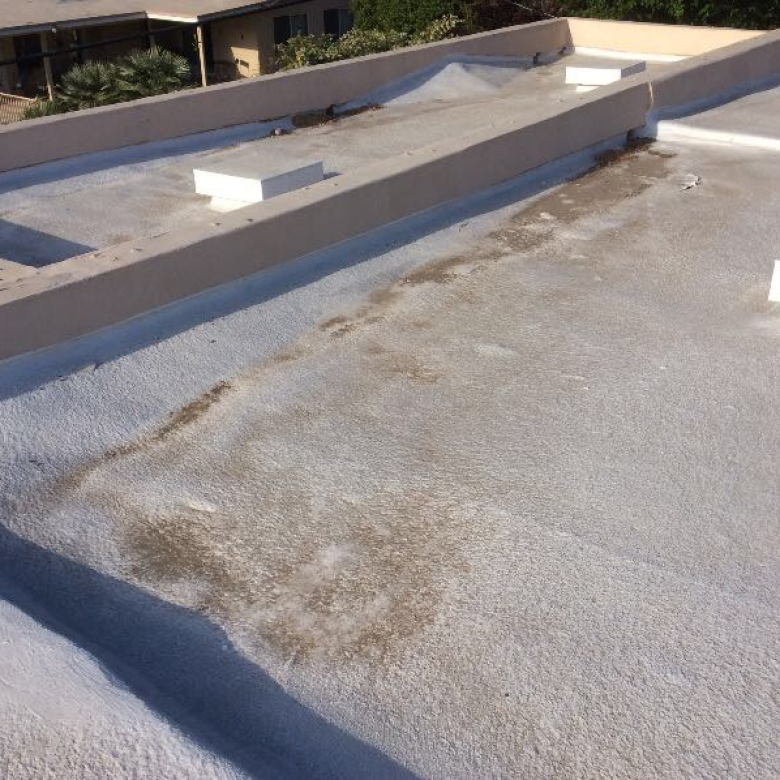 Don’t let your flat commercial roof suffer from ponding water. Please contact us and find out more about how our RoofSlope product can solve drainage issues.